Why Your Ketogenic Food is Unhealthy | Sahara Dairy Co.
A diet, that lets you eat crispy bacon, full-fat dairy, delicious oils, beef steaks, and all the butter you can dream of. Outdated health communities look on in a salivating jealousy whilst chomping on their dry turkey burgers. The return of blissful healthy eating is finally here, it’s the Ketogenic Diet. But, it’s not just the satisfaction of stuffing their faces with repressed saturated fats that have people rethinking their diets. The ketogenic diet has lead to dramatic weight loss, increased energy, reduced cholesterol & triglycerides, neurologic improvement, and lean muscle growth. It’s even been cited to possibly benefit over 15 health conditions! Eating Keto is a diet where you consume 75% of calories from fat, 20% from protein, and <5% from carbs. Unlike diabetic ketoacidosis, which is life-threatening, eating high fat whilst restricting carbs and sugar stimulates a low-grade ketosis state. 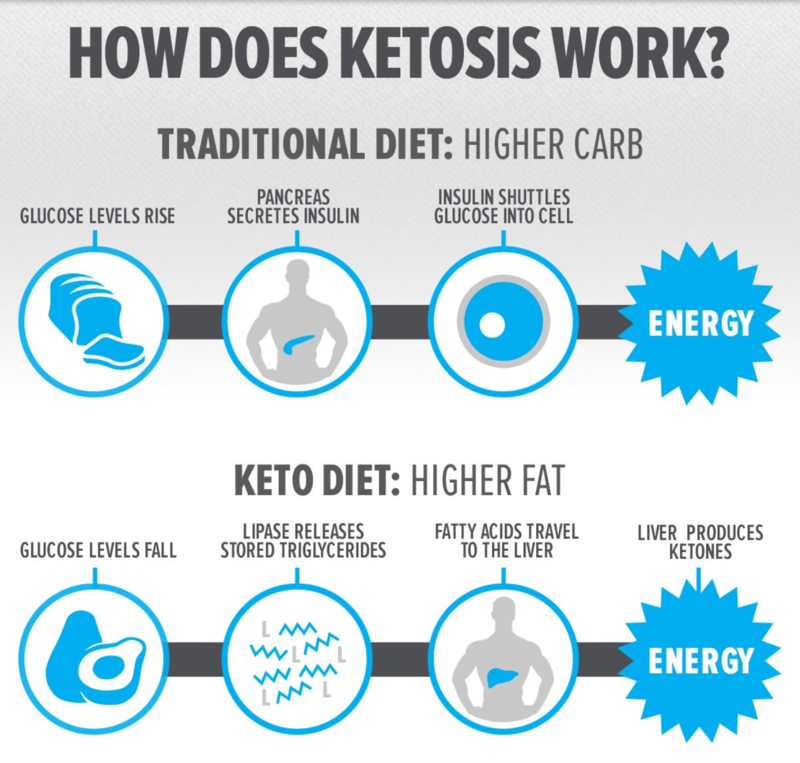 Healthy low-grade Ketosis leads to a very stable and healthy fuel source for your body and brain. However, is Keto food actually as healthy as they say? Can we literally, weave our pizzas out of bacon strips, dump a pound of cheese on it and call it food for your wellness? Soon, you’ll discover how most Keto food is toxic and could be driving inflammatory processes that may negatively affect you later. Eating a balanced high fat Keto diet can bring a positive metabolic shift for athletes and dieters alike. But if you’re eating keto without an educated attention to your food quality and quantities you can create inflammation, hormone disruption, microbiota imbalances, mineral imbalances and worse! Restricting carbs for weight loss and diabetes has been in use for quite some time. Like the Atkins diet, the Keto diet has stonewalled any type of grain or sugar. The focus is on getting high amounts of fats, preferably, saturated fats. But unlike Atkins, Keto goes a step further and even restricts high consumption of protein. Why restrict sugar, carbs and even protein? The goal is to maintain low blood sugar levels and insulin levels so that your body flips from glucose dependency to an adapted fat burner. In the case of carbs and protein, both are broken down enzymatically and converted into glucose. Conversely, when your body starts using ketones for fuel in ketosis, your body stops breaking down muscle for glucose and screaming with ghrelin (hunger hormone) to consume sugar every 2-3 hours. A common comparison is lent to both keto and glucose adaption. If you needed to start a fire to keep yourself warm, would you ignite a gallon of lighter fluid (Glucose adapted)? Or would you gather wood and kindle a slow burning fire (Ketosis)? Before you go running to your nearest store to buy out the butter and bacon sections, the Ketogenic diet may not be the savior of our dietary sins. Because these “keto friendly” foods touted by blogs, books, and zealot-like dieters may actually be seriously harming your health on the road to low-grade ketosis. Do you see anything wrong with the video above? If you’re a Keto maniac you’ll shake your head because “There’s no carbs or sugar!”. But like all diets gone wrong before, people get consumed with the dietary parameters and become blind to the nutritional value of their foods. If you don’t have keto tinted glasses on, you’ll recognize the Keto’s obsession with bacon, pork fat, slow-cooked pork shoulder and everything in between. But apparently, we’ve forgotten our health lessons. However, beef and poultry are no exception. Factory farming and grain feeding livestock has destroyed the nutrition of our meat products and has even made them harmful to consume! Indeed the diets of our modern livestock have created nutritionally deficient meat, lacking precursor antioxidants and healthy fats normally inherent in grass-fed meat. One of the pertinent deficiencies in today’s meat is conjugated linoleic acid (CLA) levels. Human consumption of CLA is very important and healthy levels in your food have been studied to reduce heart disease risk, support blood sugar  and even prevent cancer  . Furthermore, things like cured meats (bacon), deli meats, and sausages may be thought of as keto-friendly. In reality, most of these should be avoided at all costs! Processed meats contain a myriad of hidden toxins, even if it’s labeled organic and non-GMO! Nitrates & Nitrites Toxic to humans, per the American Meat Institute: Symptoms include vomiting, headaches, breathing difficulties, allergies and death. Additionally, the presence of nitrates and nitrites in processed meats has been linked to cancer. Sulfites, or sulfur dioxide: A fungicide and preservative to prevent spoilage. Sulfur dioxide bleaches rotten sections of meat, hiding it from view and destroying vitamins. Artificial sweeteners. Many processed types of meat are sweetened artificially with aspartame, saccharin and other chemicals. These have been linked to various allergies, headaches, behavioral disorders and neurological problems. Additionally, saccharin is linked to cancer. Emulsifiers and thickeners: Used to change the texture of processed meats and prevent ingredients from separating. One common emulsifier, propylene glycol, is a synthetic solvent. It damages the skin and causes neurological side effects. If you look through a Ketogenic cookbook, you’ll see a grotesque amount of dairy products. Not only do almost all keto recipes call for it, but the actual quantity is dumbfounding. Keto Genic Cooking by Maria Emmerich calls for multiple cups of heavy cream, half a package of cream cheese or butter and entire dishes basically made from mozzarella cheese! A modest consumption of dairy is admissible and actually healthy. But, most keto fanatics increase their dairy intake many times over because they’re looking for a good source of fat. Fermented dairy products: ex. Kefir, yogurts, some cheeses, sour cream. Pasture-raised: Organic or non-GMO doesn’t guarantee quality dairy products. Remember, healthy and happy cows make the best milk! Raw Dairy: Raw dairy isn’t available for everyone, but if your a healthy adult with a good raw dairy source it could be beneficial for you. The reason your dairy quality is of major importance is that we have an epidemic of inflamed and infected dairy cows with overwhelming amounts of mastitis. What results is pus, hormones, bacteria, and clots spilling into your milk which is then pasteurized and blended to not be recognizable in your cheese or milk. Not surprising that studies show these sick cows are producing lesser quality milk and cheese . In the utter determination to get all the fats they can consume; the common Keto fanatic misses out on the nutritional value in fruits and vegetables. In between the butter coffees, pork ribs, beef steaks, roasted chicken thighs, and cream cheese snickerdoodle shakes, vegetables happen to fall out of focus. The biggest flaw with the Ketogenic diet is the fact that you must limit your consumption of healthy fruits and vegetables. Though fruit should be balanced in most diets, it’s the first time that a fellow dieter may gasp at the excess number of green beans or carrots on your plate. Although, you can find a general agreement to eliminate grains, high amounts of fruits or inflammatory vegetables such as nightshades within other diets, like the Paleo Diet. The ketogenic diet is highly-focused on the fat content of their foods and makes no exceptions for any carbs. The common “Ketogenic Conundrum” is basically when you must avoid foods that have health-promoting benefits due to the aggressive carb and protein restrictions. Certainty a diverse diet is of importance, so be wary if you begin to feel the heaviness of a carton of heavy cream and a 16-oz. steak holding you down. Finally, if the necessity for whole foods in your diet isn’t apparent yet you can look at a quote from Bulletproof’s website. Bulletproof largely endorses ketogenic eating but they highlight some reasons why some people should avoid the Ketogenic diet. Low mucous production: You need carbs to produce the mucus that lines your gut and keeps your eyes moist. Some people run into trouble when they drop their carbs below 50g/day long-term. Hormonal imbalances (especially for women): A fully ketogenic diet can cause low T3 thyroid hormone if you stick with it for a long time, particularly if you’re a woman . Low energy: Some people just don’t seem to thrive running on fat. Genetics could play a role – if you lack fat metabolism genes like APOE4, you may not process fat as well . Keto has a kind of eclectic following, athletes, weight-watchers, diabetics, body hackers, brain hackers, and the list goes on. One of the highest searched for term was Ketogenic diet as people flock to this upcoming diet. But despite the general following let’s not forget that this diet was made by Dr. Wilder of Mayo Clinic 1923 to treat seizure episodes. Only later was this diet used for other disorders and general health. Therefore this diet was originally overseen by Health Care Practitioners with an extensive knowledge about nutrition and health, and this gives the diet its current credibility. In the video above, we have a Keto desert recipe, posted by Keto Connect which has close to 500,000 subscribers. This exemplifies the all-too-common tunnel vision of “fats are all that matter” and not considering the ingredients themselves. Hence we see this unmindful crafting (hardly cooking) that is nothing more than junk food disguised as “healthy” because it’s Keto-friendly. Highly Processed Flax Milk: estrogen-like properties that create a hormonal imbalance, high levels of phytates that create mineral depletion, and farmed with synthetic fertilizers and toxins. Non-Organic Chocolate baking bar: Artificial flavoring, artificial coloring, possibly contains wax, heavily processed, lacking enzymes and nutritional properties naturally found in cacao. Non-Organic Peanut Butter: Technically peanuts are legumes, which are highly allergenic and contain lectin antinutrients that inhibit digestion. Multi-stage processed attempts to reduce harmful aflatoxin molds that have been shown to stunt natural growth in children. Worse of all, they’re extremely inflammatory with a horrific omega-6/omega-3 ratio. Low-Quality Protein Powder: Whey protein isolate is highly processed with known heavy metal contamination along with being obtained from factory-farmed cows. Low-quality protein powders contain artificial preservatives and colors to keep it “fresh”. Federal regulations do not generally require that protein drinks and other dietary supplements be tested before they are sold to ensure that they are safe, effective, and free of contaminants, as the rules require of prescription drugs. “It is foolish to have these and other dietary supplements being sold with practically no regulation,” says David Carpenter, M.D., head of the Institute for Health and the Environment at the University at Albany. Sugar-free maple syrup: Too much can be said about this thick chemical liquid. See for yourself what “Keto-friendly” means with this label straight from Maple Groves Website. Most “Keto-friendly” food isn’t healthy. Swapping out sugar/carbs for contaminated, toxic and highly processed fat sources isn’t healthy. In addition, if your cutting whole nutritionally-dense foods like vegetables and fruit to eat junk only possible by man-made processing and labs, is this healthy? The answer is no! This simple solution is to accept that junk food is junk food. Though there may not be sugar, you’re still causing inflammation, toxicity, liver detox overload, kidney stress, and microbiome imbalances. To name a few. The ketogenic diet as a whole is a great Metabolic shift for the human body. Some dieters eat a healthy high-fat and low-carb diet which includes whole foods and quality ingredients. Furthermore, the ketogenic diet has assisted countless people to lose weight, improve their overall health, dramatically transform their athletic performance and even resolve a major health crisis! At the same time, this diet is very tricky and is commonly undertaken without prior knowledge of how keto works and basic education on nutrition. Hence there is a proliferation of junk keto food like bacon-weaved pizza from factory-farmed pork and Snicker fat bombs made with unidentifiable toxic syrup and harmful butter. So, before you start Keto, read up heavily and take the words of advice from knowledgeable fellow Keto dieters. Although Maria Emmerich’s recipes were quoted early for their exorbitant dairy amounts, read the beginning of her cookbook and she prudently recommends Organic, Non-GMO, Pasture-Raised, and non-toxic/harmful foods. 29986720; PubMed Central PMCID: PMC6038311. LaManna JC, Salem N, Puchowicz M, et al. KETONES SUPPRESS BRAIN GLUCOSE CONSUMPTION. Advances in experimental medicine and biology. 2009;645:301-306. doi:10.1007/978-0-387-85998-9_45. Pagidipati NJ, Gaziano TA. Estimating Deaths From Cardiovascular Disease: A Review of Global Methodologies of Mortality Measurement. Circulation. 2013;127(6):749-756. doi:10.1161/CIRCULATIONAHA.112.128413. DiNicolantonio JJ, Lucan SC, O’Keefe JH. The Evidence for Saturated Fat and for Sugar-Related to Coronary Heart Disease. Progress in cardiovascular diseases. 2016;58(5):464-472. doi:10.1016/j.pcad.2015.11.006. 22291727; PubMed Central PMCID: PMC3258689. Spruijt-Metz D, Belcher B, Anderson D, et al. A high sugar, low fiber meal leads to higher leptin and physical activity levels in overweight Latina females as opposed to a low sugar, high fiber meal. Journal of the American Dietetic Association. 2009;109(6):1058-1063. doi:10.1016/j.jada.2009.03.013. 10.1093/ajcn/83.6.1505S. Review. PubMed PMID: 16841861.
cuts: potential impact on human health. Asia Pac J Clin Nutr. 2006;15(1):21-9.
anticarcinogen from animal fat sources. Cancer. 1994 Aug 1;74(3 Suppl):1050-4. Chouinard-Watkins R, Plourde M. Fatty Acid Metabolism in Carriers of Apolipoprotein E Epsilon 4 Allele: Is It Contributing to Higher Risk of Cognitive Decline and Coronary Heart Disease? Nutrients. 2014;6(10):4452-4471. doi:10.3390/nu6104452.